When you purchase an A.O. 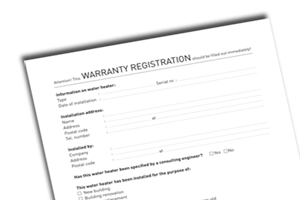 Smith product you’ll receive a paper warranty card with the appliance. As of now you can also register your product online. On the A.O. Smith website you can find a link to a Product registration form. Fill out all the fields on the form and this will automatically be sent to A.O. Smith. After you click the button Submit, you will receive an email stating all the details you have just sent to us. This tool makes it very easy to register your product, quickly and easily. Online product registration is very easy for A.O Smith as well. And reducing the paper flow fits the green thought. The online registration form can be used for all A.O. Smith water heaters and boilers.